Machetazo was born in the year 1994 in La Coruña, Spain. The second demotape was the one who opened a lot of gates,catching the attention of Charlie Infection(ex-drummer of Psycho) who released it on 10"MLP and getting proposals for a few splits and of course the deal with the New York based label Razorback Records,their main label still 'til today. 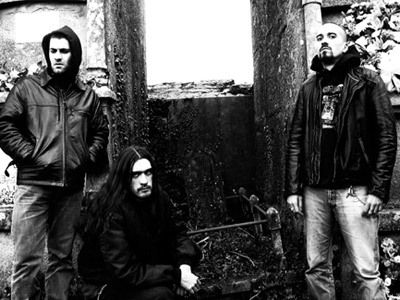 Machetazo during the first years was mostly Dopi's project,with various collaborators and members going in and out,but after the release of the first album Rober came at guitars as a definitive member. Rober and Dopi recorded the second album and just after the release Carlos came as bassist in the year 2001,then we could say Machetazo started to be a real band, a classic power trio that still prevails 'til today, trying hard to survive in a country with nule support for underground extreme music and fighting trends and obstacles everyday. 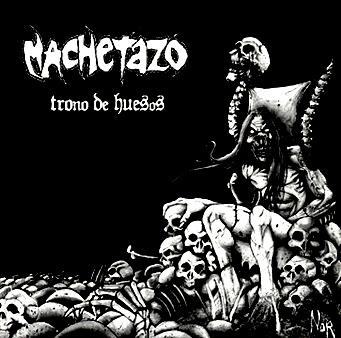 Anyway Machetazo has a strong reputation and feedback worldwide specially in the USA,Mexico and Japan. The band has worked and still works hard in promotion and distribution with the help of a lot of independent labels that have always make their best to help Machetazo to spread the insane word of horror and grind. 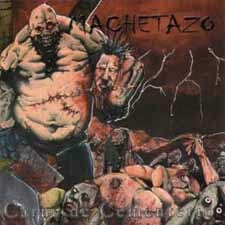 A ton of underground zines and big magazines like Terrorizer,Pit or Short Fast And Loud have featured Machetazo in his pages. The high points in band's history have been without doubt the split eps with cult acts like Corrupted,Abscess or General Surgery and the special guest vocals made by Chris Reifert(Abscess,ex-Autopsy,ex-Death...) in their latest album.